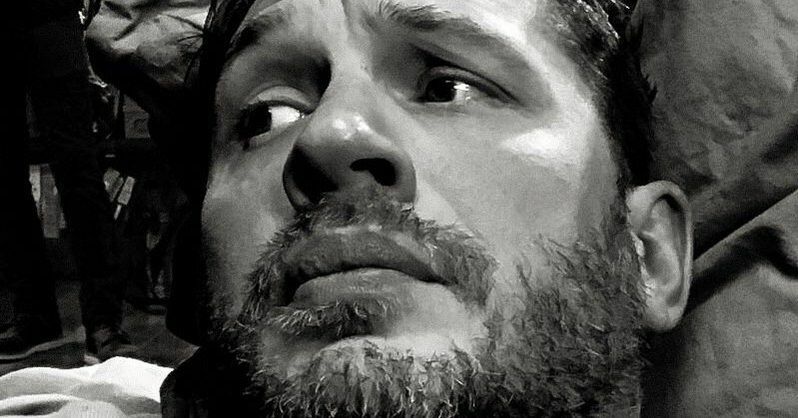 Production on Sony's Venom is in full swing and Tom Hardy has shared a new picture from the set. Production began late last month on the Spider-Man spin-off and details are still sparse, but Hardy's excitement for the project is clearly evident. Venom will adapt the comic book limited series Venom: Lethal Protector, which is a storyline that sees Eddie Brock relocate to San Francisco after coming to a truce with Spider-Man. Things are even going relatively well for him for a while until someone from his past finds him, seeking revenge and unleashes five super-powered symbiote offspring (Scream, Phage, Riot, Lasher, and Agony) to take him out. While the new photo doesn't reveal anything about the plot of the movie, it is some good viral marketing for the project and Tom Hardy is the only one from the project that has posted on the official Venom Twitter account. It's an interesting marketing strategy, though it's something that filmmakers, as well as actors and actresses, have been doing more and more often, connecting directly with the fans during the production process. Zack Snyder uses Vero while Ron Howard uses Instagram and Twitter. One byproduct of the newest superhero movies is that pretty much every A-list actor or actress, at some point, becomes a hulking beast. Tom Hardy is no stranger to working out, but his latest role as Venom, has required a particularly martial training regimen. Hardy has been working out with Nathan Jones, a professional MMA fighter, and trainer Mark Mene to prepare for the role and the training looks as if it's been pretty intense. Tom Hardy's new physique has been shown off in recent photo leaks from the set. Hardy looked low-key in an all-black ensemble, including a waterproof jacket, buttoned. He wore a New York Yankees baseball cap low over his head and a pair of headphones around his neck, seemingly dressed down and not in character. His outfit didn't appear to be reporter-esque, but it's possible Tom was shooting scenes of Eddie Brock out of his work clothing. Fans are eager to get anything from the new production and we haven't been able to see much. The news of the Venom movie was announced by Sony over the summer when they tweeted a black and white picture of the actor looking down the camera lens, wearing a T-shirt with Venom's notoriously toothy face on it. The tweet announced that the movie is set for a release on October 5th, 2018 and will be part of Sony's Marvel Universe. This caused confusion among fans of the franchise, as Spider-Man: Homecoming was released over the summer, via Marvel Studios, with Venom a Columbia Pictures release. Fans were desperate to know whether there would therefore be a crossover, with Marvel Studios president Kevin Feige confirming that the movie was solely a Sony project and Marvel had no plans to connect it with the Marvel Cinematic Universe. You can check out the new picture from the set of Venom below, courtesy of Venom Movie's Twitter account. Venom 2 Loses Original Director Ruben Fleischer?